So I went to ping some steel and this happened. Any ideas on how to fix it? The round that's partially fed keeps the magazine from dropping so I can't do that. Can't you push the round forward the rest of the way out of the mag and partially into the chamber? If not I think you should be able to lever it up using a very thin blade screwdriver. The lips should flex enough to let it loose. Just watch that the blade tip does not contact the primer. I can't move it easily and I'm slightly worried about trying to force it. I don't want to bend the lips. If you depress the other rounds, it should ease up on the tension enough that you can push the round out of the way. It is released enough that you aren't going to hurt the feed lips if you just yank the mag out. The round is pretty much lodged, it doesn't give at all when I push on the rim, even when I push down on the next round. How bad of an idea would it be to tap on the rim of the round? The round under the top round looks like it is stuck nose down in the mag. Is there any chance that these are 9mm Luger rounds and not 9x18 rounds? Sorry to suggest this but it would account for the top round being "lodged" and very difficult to move. other wise maybe some needle nose pliers and pull the rim striaght up? it should not bend the feed lips and if it does it should not be much and it can be fixed. Well it's out of a box labelled 9mm Makarov so I actually fired a mag of the same rounds previously. I finally bit the bullet and went in there and just pried it up, so it's good now. Tomorrow I'll try shooting again and see if it happens again. Was 9mm Mak usually steel or brass cased? All original 9x18 Makarov was steel cased. Brass cased is actually second generation ammo. The P64 was designed with steel cased ammo in mind. Sorry for suggesting that you had loaded 9 luger, but there have been a bunch of people who have done so after reading the 9mm on the slide. And a bunch who have loaded and fired it on purpose. Just Google it and see. Glad your back up and running. That was an odd one I have never seen a P64 do. Let us know how the next range session goes. Oh no offense taken. I've worked in customer service for about 6 years now, I know just how dumb people can be. Glad it's out... Yeah the Casing on the second round looked like the correct length for the 9x18 Makarov, can't tell on the first. Make sure you give it a good cleaning before the next range time. Also make sure you mark all of you Magazines in some way. If it happens again then you will know if it's the same magazine or not. Well I tried the other mag and it jammed on the last round. I THINK, but I'm not positive, that the slide was hanging up on the extractor. I had to put the slide against a table and shove downwards to dislodge it and have it close again. I'm thinking I won't shoot it again until I've had time to do a deep clean. I have found it a good practice to disassemble and deep clean any used or surplus gun before a range trip. Not a bad idea on new guns either! ^^^^ +1 especially the firing pin and FP channel on semi auto pistols. 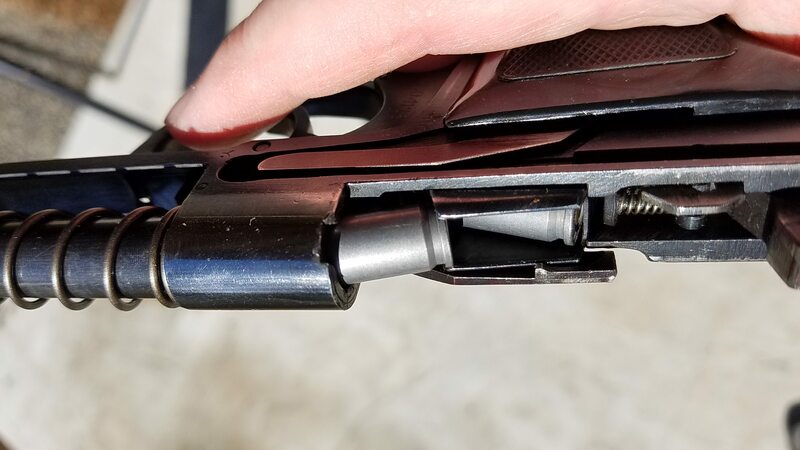 Since (per the picture) you have your P64 disassembled, you should be able to depress the round in the mag while pushing the semi-chambered round out by the rim. I had the same thing happen to me routinely until I started loading only FIVE ROUNDS MAX in the mag. This fixed the problem for me, and I shoot pretty much everything commercial and hand loads now with no FTF. I've also seen a video that has you point the pistol muzzle straight up and rack the slide vigorously until the jammed round ejects. That also seemed to work, but again I'm not brave enough to do that routinely. I also recently bought replacement high power mag springs from Wolff, but I haven't installed them yet. They also claim to fix the FTF problem. We'll see.